This 4L could be short for a surname, a nickname. It is similar to the word “mezuzah,” the prayer scroll placed in doorways to bless one’s home. The letters as an abbreviation can work for many unions or organizations, or as an automotive reference. The letter M may help make this a model reference of a product line. 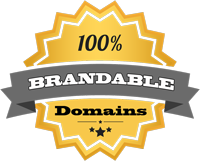 But without any acronym use this domain still has great value in its brevity and pattern. Just as Asian countries have leapt to embrace numeric domains as smart, distinct names to use for different consumer and service websites, westerners are beginning to utilize concise letter domains as stylish website brands.